My English friend is always amazed at how many French people live in New York. (The answer is over 60 000 in the five boroughs.) And at how all these French people tend to stick together, eat together, listen to music together, dance together. Language is certainly a common ground for this close-knit community, but is that the only reason? In my last two jobs as Editor-in-Chief of France-Amerique,a magazine in French published here in America, and as Vice President at the French Institute Alliance Francaise, I had time to study that species : French expats in New York.They belong to different categories. There are those who make no effort to change their French way of life and if you wander around the Lycee Francais de New York on York avenue and have an early coffee at Benoccio’s you will meet a lot of them. 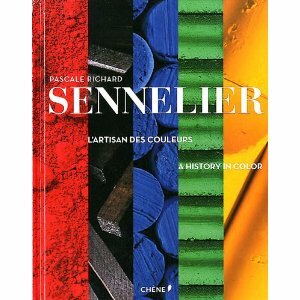 (A great way to practice your French by the way). Some on the contrary make a point at “not seeing other French fellow-men” and sometimes become violently anti-French. They might run businesses or institutions in the city and fear that their French background might endanger their success in penetrating New York social life. What is so shameful about the French by the way? Most navigate in both waters, loving their life in New York and their American friends, yet longing for their secret French garden. No one better than Herve Pierre, Creative Director for Carolina Herrera expresses that feeling. In this week’s New York magazine in Neo Versailles by Wendy Goodman (http://nymag.com/homedesign/spring2010/65750/), features this wonderful fashion designer who, before working for Carolina Herrera, designed for Bill Blass.”I am in New York during business hours, but at home I need to be in Paris”. Quite right. 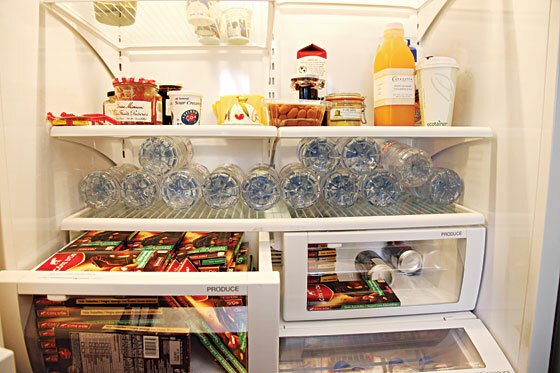 In his fridge Herve only has Evian water, Cote d’Or chocolate, and foie gras. Food is definitely a bond between French expats who like to share good addresses like White Toque (www.whitetoque.com) for the pomme Dauphine ( royalty is never very far)or Dartagnan ( http://www.dartagnan.com) for the foie gras and the magrets. 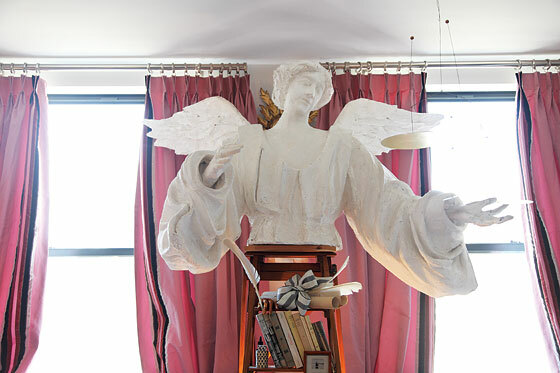 Wendy Goodman describes Herve Pierre’s apartment as “the only condo on Lower Fifth Avenue transformed into a “cabinet de curiosites”. I love that image! Yes we do love those cabinet of curiosities where collectors in the time of Louis XIV assembled artifacts from the New World “the clothes, weapons and tools of newly discovered peoples”. In reverse, French expats’s “cabinet de curiosites’ are clustered with images and objects of the Old world. 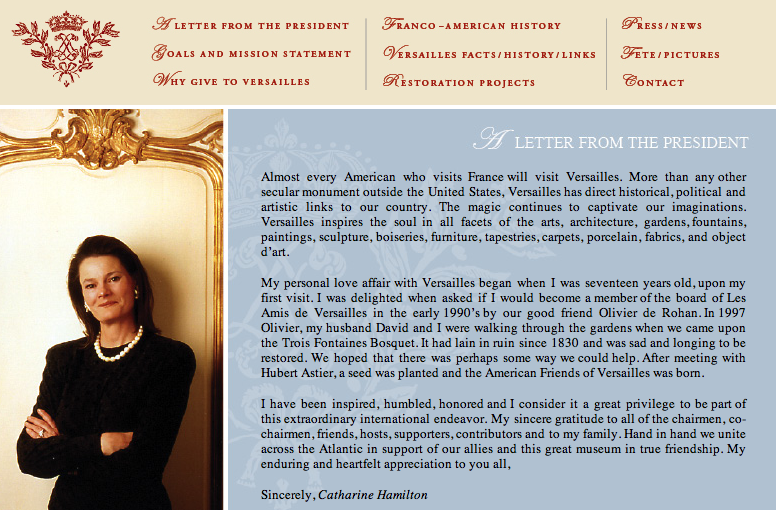 Herve Pierre has this passion for Versailles that of course I share. “I go to Versailles at leat three times a year alone with my Ipod” says Herve. Like him I visited the Chateau to research my book Versailles The American Story at a time there were no tourists.I really believe Versailles is the knot between France and America (hence the book! ), the very start of our privileged relationship, the starting point of a long history of misunderstandings, but also a shared nostalgia for history, for all things beautiful. This year in June, the American Friends of Versailles led by Catherine Hamilton will organize yet another ball in the Galerie des Glaces. The money raised will help restore the Pavillon Frais in the Park. 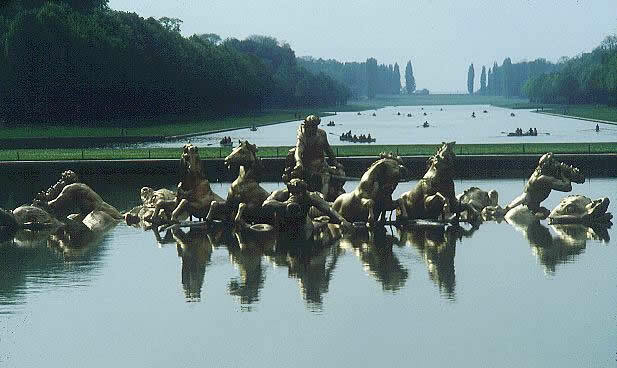 When I long for my far away country, I dream of morning awakenings in damp country beds, of foggy patches on the countryside, of stone walls and hearty luncheons,and of the beauty of the Bassin d’Apollon is the spring light. You ask – “What is so shameful about the French by the way?” Where shall I start…… Of course, the difference with the English is that we don’t want to see our compatriots in the evening or during the day. We go totally native. And we don’t stock our fridges with roast beef, suet pudding and stilton either! Thanks for this blog highly interesting with an amazing mix of topics. Your blog is now in my favorites.